The youngest county in the County Championship added a third title to their cabinet this season, sealing the issue last month with a round still remaining. Durham, who were awarded the status of a first-class county only in 1992 (seven decades since the previous newest team) now boast of a rare three Championship victories in the past six seasons – 2008, 2009 and 2013. Durham’s moment of glory came on 19th September in the penultimate round of matches, when they posted a comfortable eight-wicket victory over Nottinghamshire at their home ground of Riverside at Chester-le-Street. Nottinghamshire were blown away for only 78 in their first innings, and despite making a much better 246 in the second dig, they were never going to pose problems to Durham (256 and 69/2) . The champions lost their final round match to Sussex, but that mattered little. Durham won more games than any other team in either division – 10 as against 4 defeats and 2 losses. Their final points tally came up to 245.5, while Yorkshire, who were looking to many as title favourites throughout the summer, finished second with 221 points. The start for Durham, however, was anything but smooth sailing, as they lost two of their first three matches. But the Paul Collingwood-led outfit overcame the hurdles, not to mention the club’s financial problems and the heart attack suffered by head coach Geoff Cook in July, from which he thankfully recovered soon and went on to oversee a much-deserved win for his side. According to Collingwood, the turning point was Durham’s seven-wicket victory over Yorkshire at Scarborough in the last week of August. Beating the table-toppers on their own turf surely was a boost for the team, and they never looked back from then onward. What is pleasing from Durham’s point of view is that the core of the team has always been formed by locally-bred players. An average county might have considered an inability to afford an overseas player as a blow to its chances, but Durham instead relied on its home-grown talent to deliver when it mattered the most. Collingwood took charge of the team from Phil Mustard only last season, and he has proved be an inspirational leader. In 2012, his first ten games as captain resulted in seven victories, which ensured that Durham, who were staring at relegation, finished 6th in Division One. ‘Colly’, who with his obdurate batting developed the habit of bailing out England from dire situations in Test matches, will no doubt consider this as one of the major highs of his cricketing career. The star performers for Durham were number three Scott Borthwick, opener Mark Stoneman and fast bowlers Graham Onions and Chris Rushworth. Borthwick and Stoneman logged 1022 (at 39.3) and 1011 (at 34.86) runs respectively, making three centuries each. 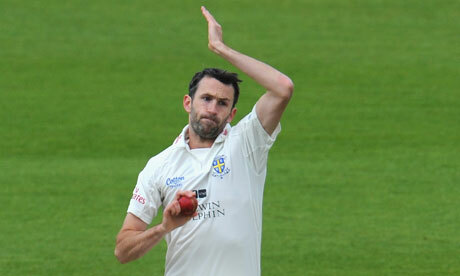 Onions was the best bowler in the championship, claiming the most wickets (70) at the best average (18.45). His strike rate too was outstanding, at 35.9. Rushworth supported him well, taking 54 wickets at 22.5. Another fast bowler, all-rounder Ben Stokes was impressive too, picking up 42 wickets and earning himself a place in the Ashes squad which will tour Australia. As for other teams in Division 1, second-placed Yorkshire were also impressive throughout, riding on the form of batsmen Gary Ballance (leading run-scorer with 1251) and Joe Root. Derbyshire (3 wins) and Surrey (1 win) were relegated, finishing 8th and 9th respectively. The two teams which will replace them next season are Lancashire and Northamptonshire, who won promotion from Division 2. Leicestershire were quite woeful, finishing bottom of Division 2 with just 79 points, 70 less than the 8th placed team. They were the only side not to win a single game in the season. Durham’s triumph has signalled that one does not need big overseas names or healthy finances to win the Championship – a committed unit and an experienced captain can be enough. For the record, Durham’s three titles are second only to Warwickshire’s four, in the period since 1992 (when Durham debuted) till date.